Urban Meyer has confirmed that he has been contacted by an NFL team regarding his interest in their head coaching ability. Meyer wouldn't confirm it was the Browns, which we can confirm that it was. 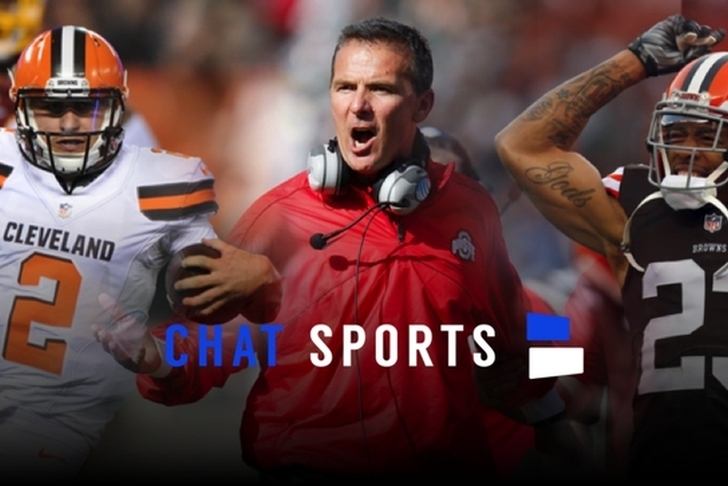 Following numerous conversations exclusive to Chat Sports over the last month with several of our most trusted sources, we have learned that the Cleveland Browns have plans to fire head coach Mike Pettine and offer Ohio State football coach Urban Meyer the largest coaching contract in NFL history. The contract would also likely include an option for a small equity ownership in the Browns' organization. The sources are close to Browns ownership and have ties to several Big Ten athletic departments. The Browns wanted Meyer as their head coach after the 2013 season and would have had a very strong chance to land him if Ohio State had not lost the Big Ten Championship Game to Michigan State, costing the Buckeyes a spot in the BCS Championship Game against Florida State. Had Meyer won a National Title in 2013, his second season at Ohio State, we are told that he would have strongly considered taking the Browns' job at that time, leaving Ohio State with a 26-0 record and a national title. Browns management received a strong indication at that time from those closest to Meyer that he was interested in the role and that the Browns or Bengals would likely be the only jobs he'd ever leave Ohio State for. But, when Meyer's Buckeyes lost to MSU, and followed it up with a loss to Clemson in the Orange Bowl, Meyer put any talk of the NFL to bed and committed to Ohio State for the foreseeable future. The Browns ultimately ended up hiring Buffalo Bills defensive coordinator Mike Pettine in January 2014 after being turned down by several other coaches higher on their wish list. After the Buckeyes' surprising National Championship earlier this year, Browns officials reached out to Meyer through back channels to gauge his interest in walking away from the Buckeyes to become head coach for the Browns. At the time, the Browns were only one year into the Mike Pettine era and didn't have any plans to fire him, but considered Meyer a home run hire that would be enough cause to move on from Pettine after one season. With nearly his entire team returning for 2015, Meyer was not receptive to the Browns at that time, focusing on the potential of winning back-to-back National Championships with the Buckeyes. There is one thing we want to be clear about in regards to our information on this - none of the sources have confirmed that Meyer is interested in moving on from Ohio State to become the Browns coach. The sources have, though, been adamant that the Browns have an air of confidence that Meyer will be their man in a matter of weeks, and that the Browns are already working back channels on early contract negotiations with those closest to Meyer. Our sources tell us that Browns owner Jimmy Haslam is leading the pursuit of Meyer, and that he is prepared to give Meyer full front-office control, including the future of GM Ray Farmer. Haslam is swinging for the fences here and has brought his hefty check book with him to make sure he can land the Buckeyes' championship coach. The numbers on a potential offer are, well, staggering to say the least. Our source has has said that $10 million per year is the starting point of potential negotiations, with minority ownership in the Browns being a part of the package that could add up to another $20 million to the contract over the lifetime of Meyer's potential era as Browns coach. Saints coach Sean Payton and Seahawks coach Pete Carroll are the highest paid coaches in the NFL right now, at $8 million per year, with Patriots' Bill Belichick close behind at $7.5 million, though none of them have an ownership stake in the franchise. Belichick and Carroll both have full control of player personnel, something that Meyer would be offered in Cleveland. The last college coach to go to the NFL, Eagles coach Chip Kelly, makes $7 million per year and was given player personnel power after his 2nd season. The timing may never line up better for Meyer to take a job in the NFL. He is coming off the best four-year run of any Big Ten coach in modern history, is widely considered one of the best college coaches of all-time, and will likely be 're-loading' at Ohio State next season as the school is preparing for a mass-exodus of talent after this season, including a potential eight underclassmen declaring for the NFL Draft. Meyer's history shows he rarely stays at one place for too long, and has not yet shown the interest in reloading a roster after successful runs at other schools. His coaching tenures to date have been two seasons at Bowling Green (9-3 record in second season after inheriting a 2-9 team), two seasons at (Utah, 12-0 in second season after inheriting a 5-6 team) and six seasons at (Florida - but it is to be noted that he did "retire" briefly after the 2009 season after failing to win his third national title in four seasons. He would leave after the 2010 season in which Florida went 8-5 in a 'reloading' season). This season, his fourth at Ohio State, reminds many of the 2009 Gators team that was going for back to back national titles, and three in four seasons. After losing to Alabama in the SEC Championship Game, Meyer returned with a completely revamped roster of players after the talent-exodus of 2009. Our sources indicate that the 2010 season at Florida was the worst four months of his life, and not one he would want to repeat in Columbus next season if he believes the returning Buckeyes won't have enough talent to compete for a national title. Barring an upset this weekend, Ohio State will not receive a berth in the College Football Playoff. If that is the case, expect the pursuit of Meyer to really heat up on the Browns' end, and for Meyer to have the ability to give the offer full consideration. Our source expects Meyer's agent Trace Armstrong to discuss the coach's future with Haslam within the next five days. Ohio State is likely to play in the Fiesta Bowl or Rose Bowl on January 1, 2016. The Browns' final game is January 3rd, 2016 and we expect Pettine will be fired the following morning.